Indian Air Force Recruitment 2018 Job alert both Fresher and Experienced can get Indian Air Force recruitment 2018 updated on January 14, 2018, notification on recent Indian Air Force recruitment 2018 openings across India. 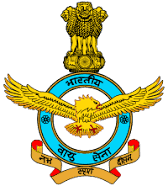 This is an exclusive page updated on 14.01.2018 for the latest recruitment notification Indian airforce.nic.in from Indian Air Force 2018 it contains both active and recently expired Job openings and recruitment notification from Indian Air Force 2018. For Multi Tasking Staff/ Safaiwala: Matriculation Pass or equivalent qualification from a recognized University or Board. Age Limit: Minimum and Maximum age limit is 18 to 25 years. Indian Air Force Selection Process: Selection will be based on Written Test. How to Apply Indian Air Force Vacancy: Interested candidates may apply in Prescribed Application form along with all documents in support of Education Qualification, Age, Domicile certificate, experience and caste certificate etc. send to Concerted addressed as per notifications on or before 30 Days from the Date of Publication. Last Date for Submission of Application form: 30 Days from the Date of Publication.